Nuts can make a fantastic addition to cookies, cakes and other baked goods. Whether you use pecans, walnuts or almonds, they all add great flavors and a nice crunch to any recipe. Another nut that I am fond of is the macadamia nut, which has an unusually smooth and buttery flavor. I particularly enjoy it when it is paired with white chocolate, as the chocolate contributes a sweetness that is noticeably lacking in the nut. This is the point where the size of the nut becomes an issue: I like white chocolate macadamia nut cookies, but would rather not have the huge nuts taking over the texture with their bulk. Luckily for me, this recipe not only made the most delicious white chocolate macadamia cookies I’ve had in a long time, but there was not a single whole nut to be seen. That is because these cookies use flavorful macadamia nut oil instead of whole nuts. This recipe came about when I was playing with a vegan chocolate chip cookie recipe that I found on a blog (which has since taken offline). The cookies used maple syrup or agave syrup as a sweetener and used oil instead of butter as the fat. The macadamia nut oil was an impulse addition for me. 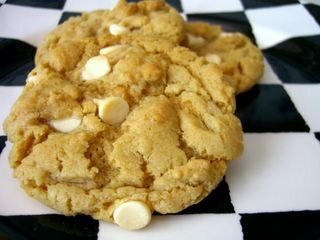 When I noticed that the batter smelled fantastic – and distinctly of macadamia nuts – I decided to mix in white chocolate chips instead of plain. The finished cookies were better than I could have hoped for. The cookies were crispy on the edges and slightly chewy in the center. They tasted like mac nuts and the white chocolate wonderfully accented the overall cookie. Though there was maple syrup in the batter, there was no maple flavor to the final cookie. The recipe makes only a few, so they disappear in a flash, but store them in an airtight container if necessary. The recipe is no longer vegan, since white chocolate chips typically include milk solids, but regular chocolate chips (which are dairy free) also work very well with the macadamia nuts and make for a great vegan cookie. If you can’t find macadamia nut oil at your usual grocery store, try a natural foods or specialty store (like Whole Foods). Otherwise, use vegetable oil to make a regular chocolate chip version and keep and eye out for it! In a large bowl, whisk together flour, baking powder, baking soda, salt and sugar. In a small bowl, whisk together macadamia nut oil, maple syrup and vanilla extract. Pour into flour mixture and stir until almost combined. Add the white chocolate chips and mix until no flour remains. Shape into ten rounded balls and place on prepared baking sheet. *Obviously, you should try to find vegan white chocolate chips if you want these to be totally vegan. Or just use regular chocolate. Great idea to sub the mac oil in a cookie recipe… weukk definitely have to remember that! I have similar nut/cookie issues. In fact, I just now finished making a batch of Heath bar cookies, and made half of them with walnuts (for other people) and the other half without (for myself). I have been using macadamia nut oil for about a year. Wonderful stuff. Thank you so much for the recipe. I did not have maple syrup so used a mix of agave nectar and brown rice syrup instead and the cookies turned out great! I used coconut oil, added brazil nuts and dried pineapples. They were so yummy out of the oven and even chewier the next day when stored in a zip lock bag. My boyfriend said the texture of these cookies are very similar to the chewy chocolate chip cookie recipe you like from cook’s illustrated, maybe even better since they are vegan! Thank you for sharing! I altered this recipe by using semi-sweet choc chips, chopped walnuts, and vegetable oil and they were darn good. I was really surprised at how good they were, and how much it was like a cookie with egg. I’m interested in trying maple syrup as a substitute for egg in brownies. What would you saw is the equivalence ratio of 1 egg to amount maple syrup? I appreciate your help! I used canola oil, macadamia nuts and chopped up white chocolate. LOVE this recipe. I used a 1 TBSP pampered chef cookie scoop and got 12 good sized cookies. I left them in for about 14 min, possibly because I used a stoneware pan to bake them on… can alter the time a little. Will definitely make these again and again!